Hosted by Eve, Paul, Vincent & William. For the month of May, USKSG will be having our sketchwalk within the vicinity of the up-and-coming hipster place of Lavender/Jalan Besar area! 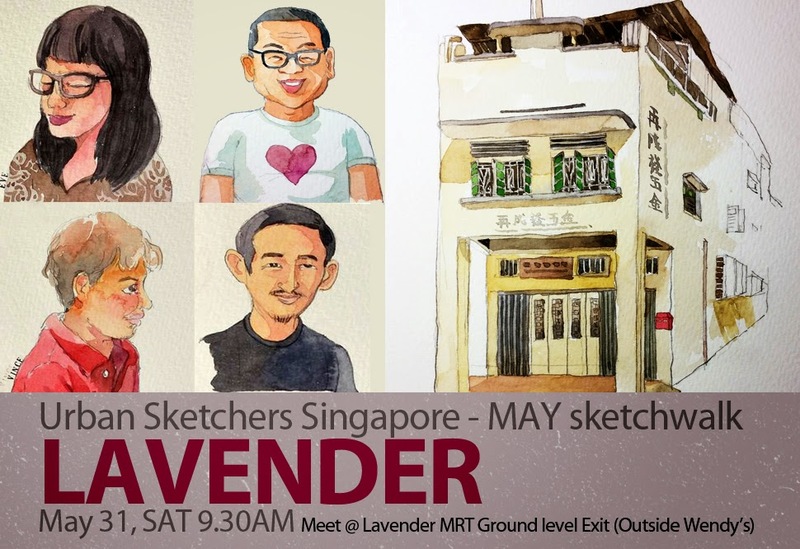 Meeting at 9 in the morning, outside Lavender MRT Station, at the space outside of Wendy’s (the junk food joint) and thereafter, depart and commence on our own sketch trails at 9.30. After which, the customary show-and-tell is in the afternoon at 12.30 under the shelter and outside Jalan Besar Sports Complex, opposite the shophouses along Horne Road. Lavender, with its once-famous landmark of the Kallang Gasworks (if you are, ahem, grown-up enough to remember) used to be the sewage area of the island during its colonial past. A popular anecdote of how the place got its name, was the colonists, who simply could not withstand the pong around and in the area, so decided to christen the place ‘Lavender’ – a term associated with perfumery and laundry. Oh, how dry and ironic, the typical British wit. Jalan Besar was part of Serangoon Road, the main transport artery of the island way back when expressways were unheard of (PIE-what? ), and was the stretch what some of our grandparents might refer to as “三马路” [sah-bey-lor (Hokkien); sah-beh-lou (Teochew); sam-mah-lou (Cantonese)]. The place, though not earmarked as a heritage site or for conservation as extensively as Little India itself, has enough history of its own. Many of the area’s buildings have been given a new lease of life, conserving its façade through grassroot business projects and businesses. The most prominent cases in point would be Kam Leng Hotel and Chye Seng Huat Hardware. Otherwise, the spot, which had seen its hey-day in the art-deco 1930s, when New World Amusement park was all the rage, has a brilliant collection of that modern, rectilinear-styled shophouses and buildings. Now breezing in on the location’s second wind, is a whole parade of cafés, lifestyle stores and multi-label boutiques that have lend their hands in creating the quirky, hipster vibe of the place. Saturday, 31 May, meeting outside Wendy’s at Lavender Station (red marker, see picture attachment below), 9AM, commencing at 9.30AM and ending at 12.30PM, outside Jalan Besar Sports Complex (blue marker). There are neither fees nor attendance taken. While there is no coaching or teaching involved, all drawing-skill levels are welcome. This sketchwalk (like all sketchwalks) is open to everyone and anyone. All you have to do is show up on time.